This article is part of the ongoing Vi / Vim Tips and Tricks series. 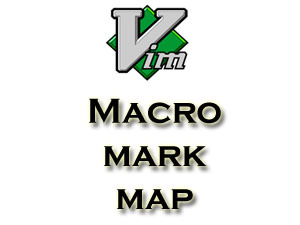 There are 3 powerful M’s in VIM — Macro, Mark, and Map. Each is intended for a separate job. Macro for recording a job and repeating it. Mark for bookmarking a particular position in a file and then coming back to it. Map for mapping a job to a key, and then executing that job by that key. In this article, let us look at various features of Vim’s Macro, Mark and Map along with practical examples. A macro is used to record a sequence of actions inside Vim. Once recorded, it can be executed multiple times using the repeat factor in vim. Refer to our previous Vim Macro Tutorial article for more details on how to use Macro to record and play inside Vim. Mark is a bookmarking feature inside Vi and Vim editor, where you can bookmark a particular line and return to it quickly later. There are two types of marks — local and global. Refer to our previous Vim Mark Tutorial article for more details on how to use Mark to bookmark inside Vim. Using Vim Map feature, you can map a key to a particular job that you perform repeatedly. In the following example, anytime you type :write , it will compile the current open *.c program file and execute the ./a.out, if the compilation is successful. :!cc % & ./a.out – The command that should be executed when the map-name is called. To execute the map, call the name of the map. In the example shown in Fig 1, :write is the name of the map. 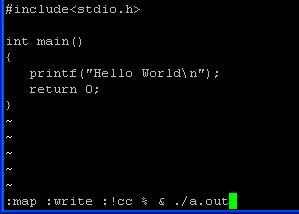 When you type :write, it will get automatically replaced with :!cc % & ./a.out inside the Vim and compile the C program and execute the a.out. Type :map that will display all the available maps as shown below. This article was written by SathiyaMoorthy, developer of Enterprise Postgres Query Analyser, an efficient tool for parsing postgresql log to generate html report, which can be used for fine tuning the postgres settings, and sql queries. The Geek Stuff welcomes your tips and guest articles. another file with the same name and a ~(tilde) is created in the end. Having this option set in ~/.vimrc , additional files created will be removed. Check it. After setting this your problem might get solved, if it does not try out the following also. If you use this option, then recovery will become impossible. But if you want this you can use it for solving your issue.